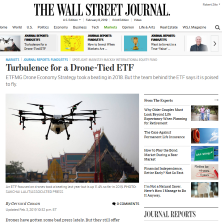 ETFMG Drone Economy Strategy took a beating in 2018. But the team behind the ETF says it is poised to fly. Drones have gotten some bad press lately. But they still offer something for investors to get excited about, according to the team behind ETFMG Drone Economy Strategy ETF (IFLY).